Take care of creation, and each other. So while most sentient beings are already pledging to skip straight to Stacey Abrams, according to the Executive Producer of Planet Earth the flagship prime time show tomorrow night will not be the broken slot machine of lies but the movement to build the political and public consensus that a Green New Deal is the solution anyone serious about climate change needs to support. With the recent blockbuster announcement strategically timed by the Divine Office of Public Exaltation (DOPE) that legislation by Senator Markey and Rep. Ocasio-Cortez laying out a Green New Deal would be unveiled this week, all doubts about which show the gal upstairs was going to tune in to (and spike ratings into the stratosphere!) were removed. To emphasize the point, she had one of her many wise sisters commit to boosting the signal tomorrow. 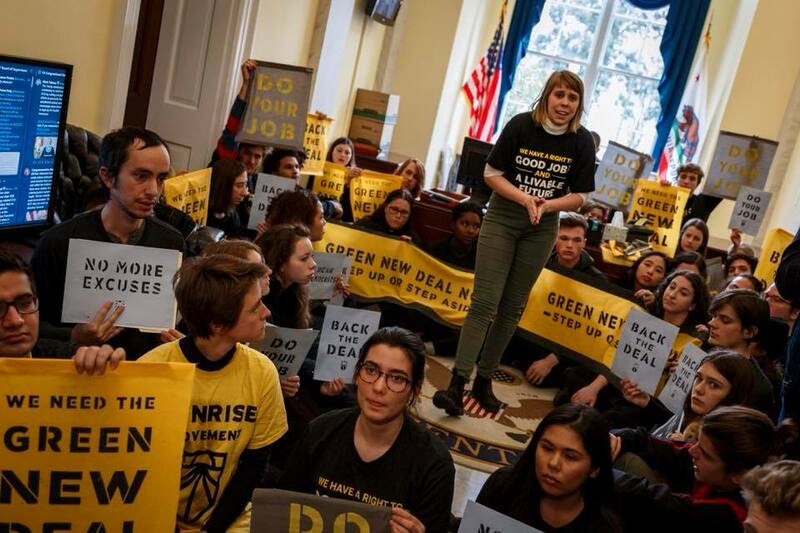 As bills like these live or die in the first few weeks based on how much support they receive, the timing of this nationwide call to rally and organize the Green New Deal troops can only be attributed to a coincidence of the third kind. To implement her clear preference for an intelligent path forward for humans to continue to live on her creation for the indefinite future over the nihilistic dystopia of fear and carnage leaking from an orange gasbag, the Lordess is raining down an extra offering of mobilizing opportunities. 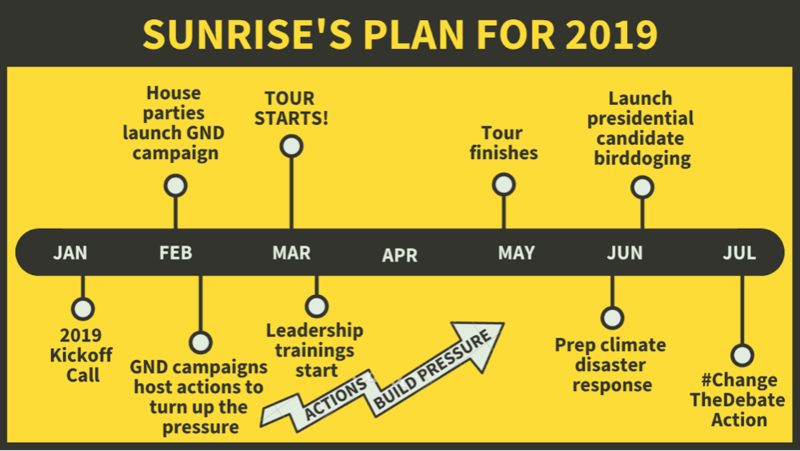 In addition to the Sunrise Movement’s Green New Deal watch parties that will overshadow the dirty-energy State of the Union address, she has arranged for a coalition of her favorite groups to organize a call for climate leadership from congresspeople that all of us can and should participate in, from February 4-8. While the Supreme Being sometimes bestows upon us what appear to be grand errors, regrettable own goals, or cruel jokes, the real reason behind them clearly is to remind her beloved humans of how bad things can get in the absence of a moral compass (and popular vote) and to get their asses in gear to do something about it. 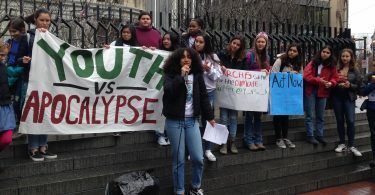 She is hoping the lesson has been learned and has hyper-charged a new generation of young and outspoken activists to lead the way in fulfilling her long-term vision of all creatures living equitably and sustainably on her little round pet project. To that end, these godsends are committed to cementing the Green New Deal at the top of the political agenda for the next three years. They will follow creation’s sacred penchant for progress and evolution by touring every region of the country to spread the GND gospel before descending upon (and bird-dogging) the primary debates by the thousands to make sure 2020 presidential candidates talk about climate change beyond whether it exists. 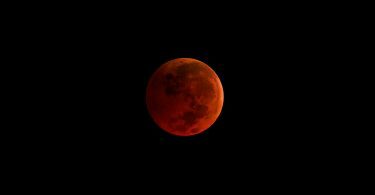 Divine providence decrees that they shall inspire Americans to elect a President and Congress that will pass the Green New Deal into law in 2021. However, since it is be very ungodlike for anything to be easy, all dreamers of a just and sustainable world are called upon to get their hands and minds on deck and help navigate this ark of a vision into safe waters. Find a Green New Deal Livestream Watch Party!